Jeff Schimmel began his Writing/Producing career in the 1980's, while attending law school in Los Angeles. When not studying for the bar exam, Jeff wrote and sold his original Cold War spy thriller, Archangel, to Phoenix Entertainment Group. Soon after, Jeff was chosen by comedy legend Rodney Dangerfield and award-winning Writer/Director Harold Ramis to co-write the full-length Warner Brothers animated film, Rover Dangerfield. This led to a sports comedy screenplay assignment from Orion Pictures and 20th Century Fox, and Jeff’s first TV writing job as Story Editor on ABC’s top ten sitcom, Full House. In a major departure from comedy, Jeff sold a World War Two drama and true life story, To See You Again, to Steven Spielberg’s Dreamworks Studios, and wrote the dark comedy screenplay, True Blue, for MGM/UA and Oscar-winner Martin Landau’s Pentagon Pictures. Jeff has also written and produced for several one hour and half hour comedy specials airing on HBO, Showtime, and Comedy Central, plus Comedy: Coast To Coast, a limited series of six one-hour nationally syndicated specials that starred A-listers like Dave Chappelle, Jim Breuer, Ellen DeGeneres, Bobcat Goldthwait, Jay Mohr, and host David Steinberg. For several years, Jeff has provided rewrite and script consulting services on numerous TV and movie projects in genres ranging from the action/comedy film, A Low Down Dirty Shame to a cutting edge TV variety show, Bargain Basement Late-Night, for Twentieth Television. Jeff has even ventured into the game show world, contributing his joke writing skills to 100+ episodes of NBC’s Balderdash and as a Consultant on 200+ episodes of the nationally syndicated Funny You Should Ask. In the mid 2000's, Jeff spent three seasons as Supervising Producer on Mind of Mencia, Comedy Central’s controversial, but highly-rated, sketch series, was Supervising Producer on No Strings Attached, a one hour Comedy Central special that sold over 1,000,000 copies on DVD, and was Consulting Producer on Comedy Central’s Last Laugh '05 year-end special, which featured performances by William Shatner, Jon Stewart, Stephen Colbert, Lewis Black, David Spade, Sarah Silverman, and Patton Oswalt. More recently, Jeff co-wrote the Russian animated series, Where's Hunter?, wrote an original pilot for Girls, Inc., a single camera comedy to be produced in Israel, was commissioned by the Premier of Bermuda to create TV projects to be filmed entirely on location, was Creative Consultant on the indie teen horror film, The Hybrids Family, which won the Best Feature Comedy Award at 2015's IFF Festival, and has been involved in developing unscripted reality TV projects with production entities such as ITV Studios, Lionsgate, GRB, Basil Street, Maverick/All3Media, and Anonymous Content. Jeff has also written and produced for BET, MTV, CMT, Cinemax, Canada’s Paragon Productions, Caravan Pictures, etc. In 2016, Jeff took over as Executive Producer of Fuse network’s music intensive Skee TV series, working with hip hop artists like Snoop Dogg, Tyler the Creator, Post Malone, and T.I. Also in the rap world, Jeff was credited as a producer on three multi-platinum selling CDs by Busta Rhymes. In 2017, Jeff’s book, “Maximum Screenwriting,” was released and has earned Amazon’s five star rating. Jeff has appeared as a guest lecturer at L.A.’s famed Screenwriting Expo, is a popular speaker at prestigious universities and film schools, and has worked closely with the Writers Guild of America to protect the best interests of writers. Since 1988, Jeff has written and produced for such diverse TV and film notables as Jim Carrey, Jamie Foxx, Robin Williams, Harold Ramis, Steven Spielberg, Dave Chappelle, Bob Hope, Ellen DeGeneres, Rodney Dangerfield, William Shatner, Jon Stewart, David Steinberg, Tony Danza, John Stamos, George Lopez, Tom Selleck, Ann-Margret, Bob Saget, Peter Boyle, Tracy Morgan, Mary Kate and Ashley Olsen, Damon Wayans, David Spade, Sarah Silverman, Greg Giraldo, David Cross, Tiffany Haddish, Lewis Black, Susan Sarandon, Mario Lopez, Paul Mooney, David Alan Grier, Bobcat Goldthwait, Stephen Colbert, Gene Simmons, Paul Rodriquez, Cheryl Hines, Bill Engvall, Whitney Cummings, Louie Anderson, Jon Lovitz, George Wallace, Gabriel Iglesias, Bobby Lee, Tom Arnold, Sherri Shepherd, Patton Oswalt, Bill Bellamy, T.I., Howie Mandel, Jay Mohr, Tyler the Creator, Snoop Dogg, Pablo Francisco, Tim Meadows, Melissa Peterman, Ken Jeong, Keenen Ivory Wayans, Martin Landau, Don Johnson, RuPaul, Vivica A. Fox, Elayne Boosler, Dr. Joyce Brothers, Wayne Newton, Natasha Leggero, Sinbad, Billy Gardell, Kevin Pollak, Busta Rhymes, Jackée Harry, Cheech Marin, Carlos Mencia, and Jeff’s late brother, the American Comedy Award's Stand-Up Comic Of The Year, Robert Schimmel. 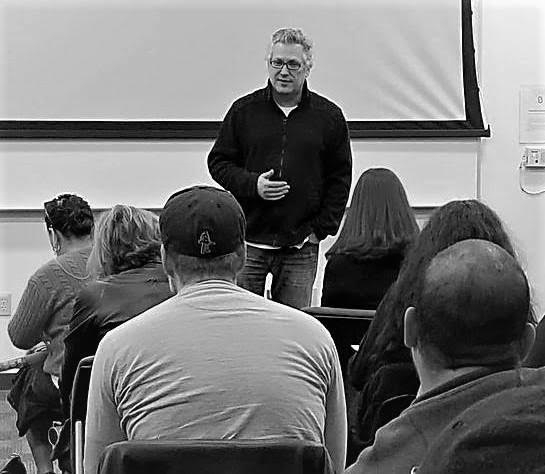 I highly recommend Jeff's seminar to groups seeking an effective, accomplished speaker to teach members about screenwriting and the realities of the entertainment industry. His lessons on structure, outlining, and defeating procrastination are, alone, worth the price of admission - and comprise only a tiny fraction of the course.